Welcome back from the long Thanksgiving weekend. I'm sure you had your fair share of turkey with all the fixings. Mine was spent quietly here at home with the dogs. 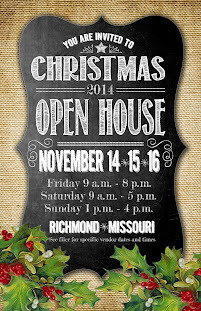 We stayed busy bringing Christmas up from storage. The first room I tackled was the sun porch. I've started adding pieces here and there. an area I've tried to cozy up with a few new pillows. I've gone crazy for pillows this year. I've chosen some that can be used year round instead of just for the holidays. When I ran across the pillows at TJ Maxx I knew they would be the perfect fit for this room. The tea set came from The Cracker Barrel many years ago. For one that has a fear of birds I love cardinals, Mr. P and I spent many an hour watching them flock to the feeder each year. I saw my first cardinal this year on Wednesday the 26TH. It was a sign to me Mr. P was watching over me. 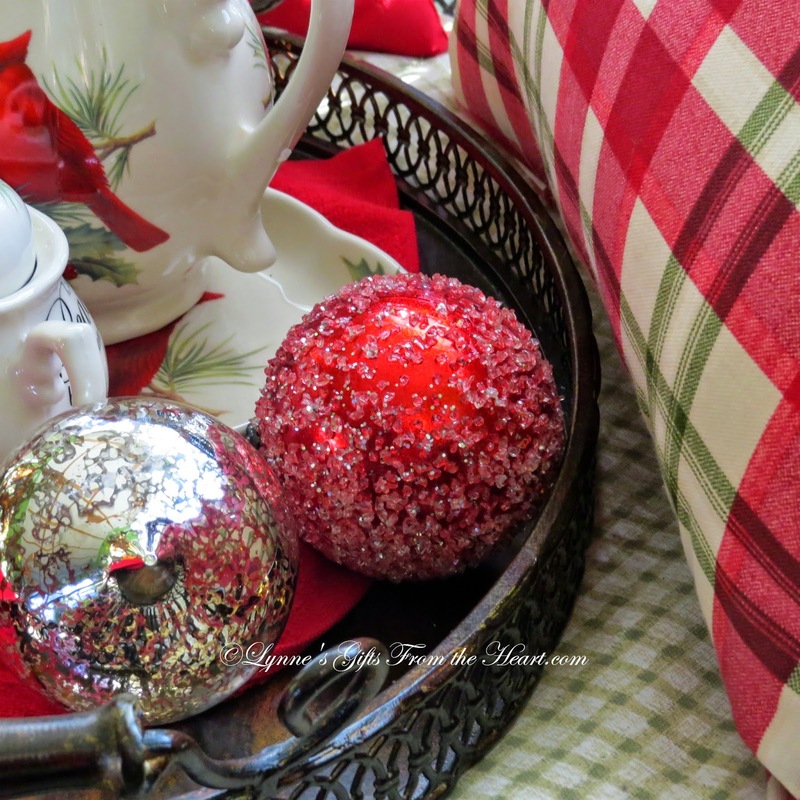 I added a few ornaments to the tray to bring a little more cheer to the corner. I absolutely love the effect when you walk in the door. 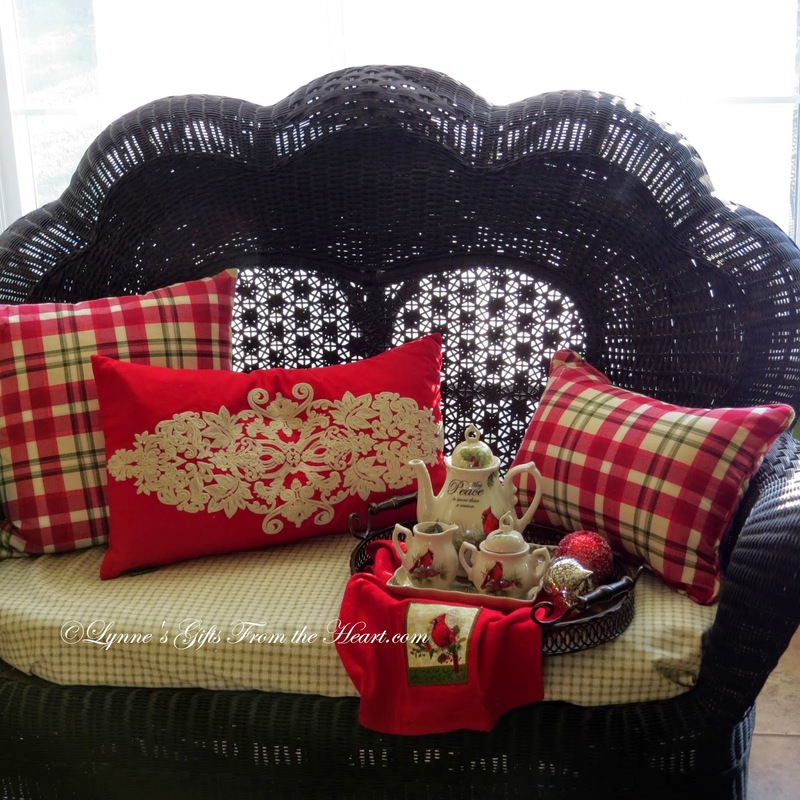 The pillows seem to put the finishing touches on the love seat. The colors are perfect for the room. 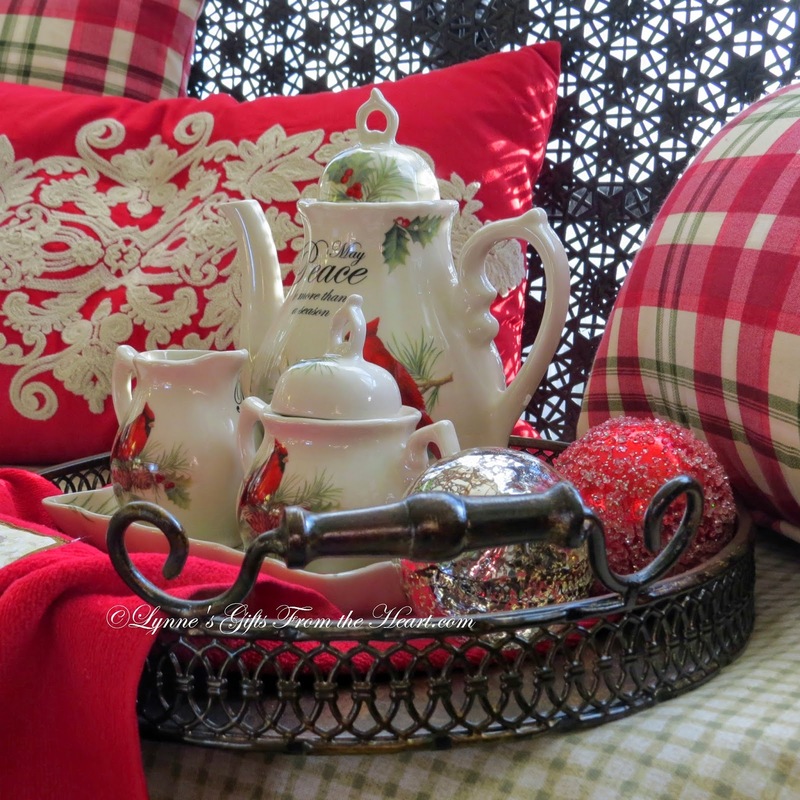 The green in the pillows coordinate with the green of the walls and the sofa, the red adds that festive touch I was going for. I'll share the full room soon, I've a bit more tweaking to do here and there. Thanks for stopping by for a spot of tea. 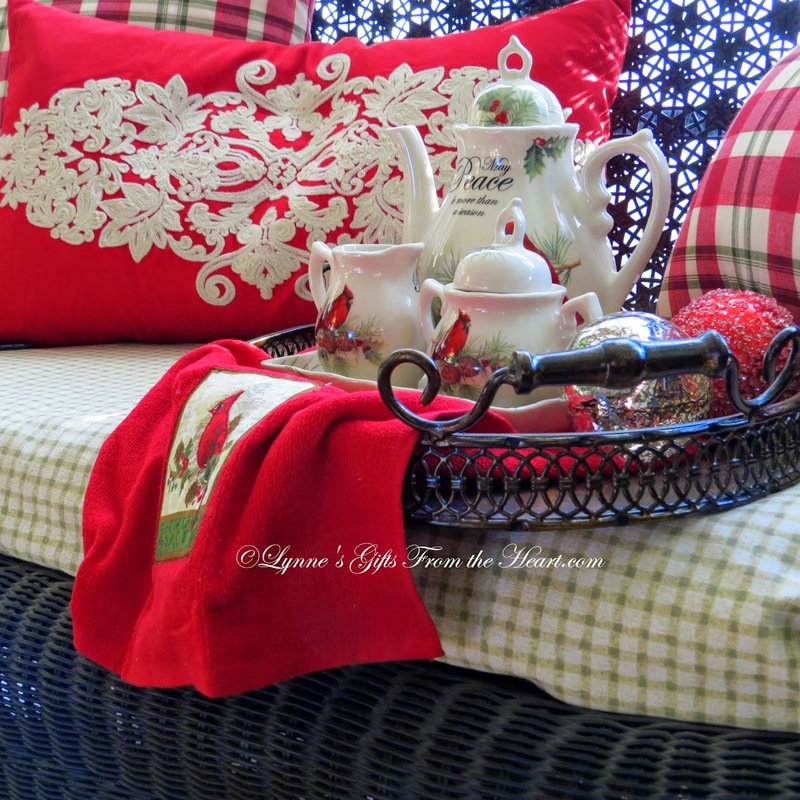 Oh, I L O V E your red and green in the sun porch, dear friend!!! The Tea Tray is beautifully styled! The ornaments set such a festive mood, indeed!!! 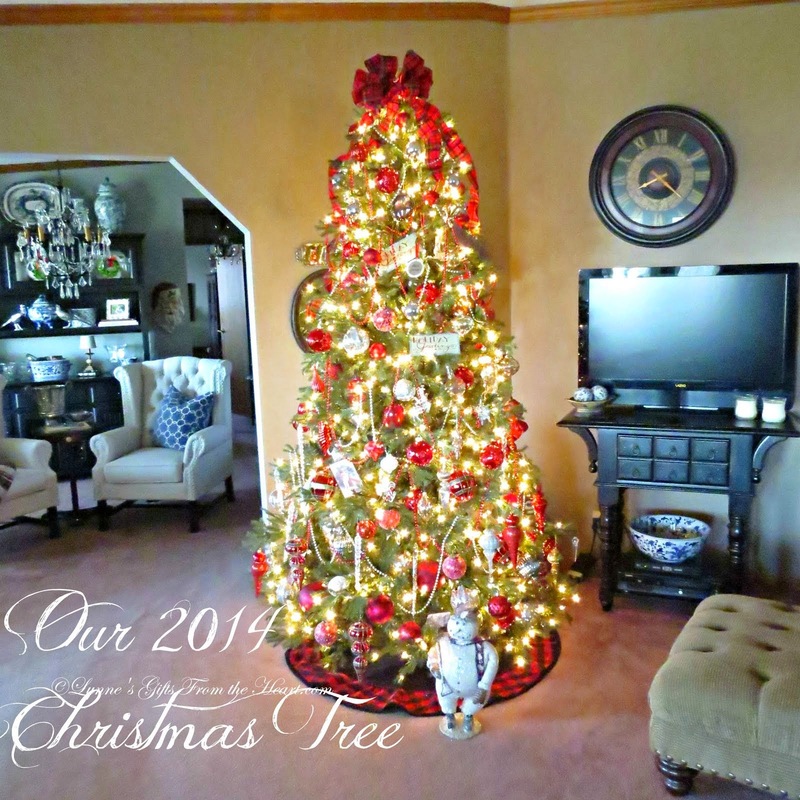 I'm nearing "The Finish Line" with my Christmas Decor. . .it's a good feeling!!! Happy 1st of December, dear one!!! Lynn I just found your blog and have enjoyed it very much! 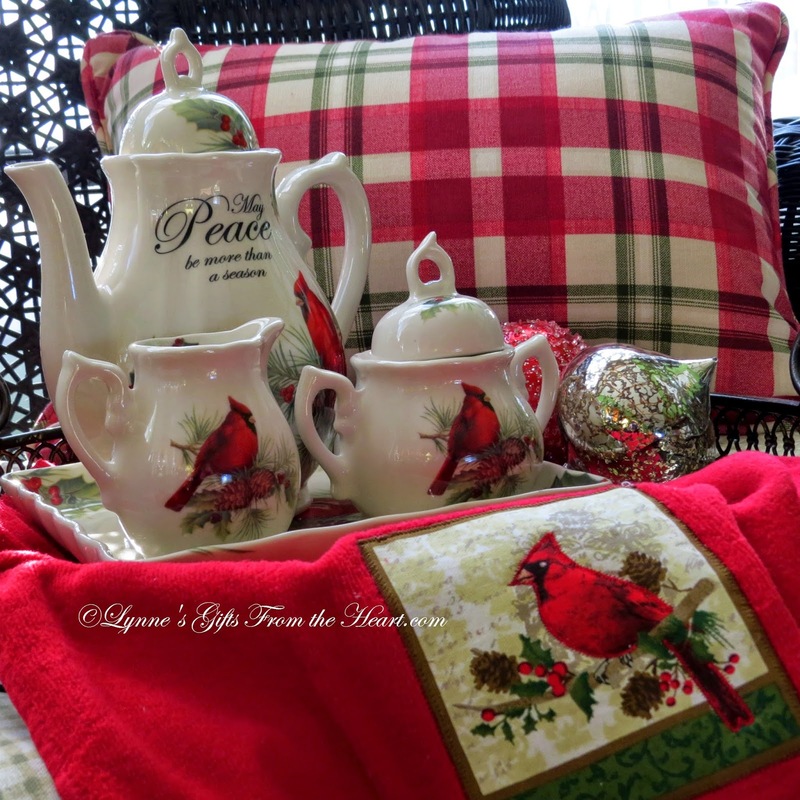 I remember seeing that Cardinal Tea Set at Cracker Barrell and thought it was very pretty! Your pillows and tea set are both awesome. I think Cardinals and Blue Birds are the prettiest birds. I am your newest follower. Lynne, this is so pretty! You're giving me such wonderful ideas for the back porch! We get cardinals quite frequently in the back yard; and they really are such pretty birds! I love looking at the decor at Cracker Barrel. They have the best accents! Susan, thank you so much for becoming my newest follower. I'm so very glad you found the blog. It is a pleasure to meet you. Oh, Lynne....he IS watching over you. That cardinal was bringing you love and peace from Mr. P for Christmas. I, too, have a profound fear of birds (perhaps because they seem to always want to dive bomb me! ), but cardinals are just too pretty to turn away. This is a beautiful service set! And those pillows....I didn't see them at TJ! Those would be wonderful for many Christmas seasons to come! 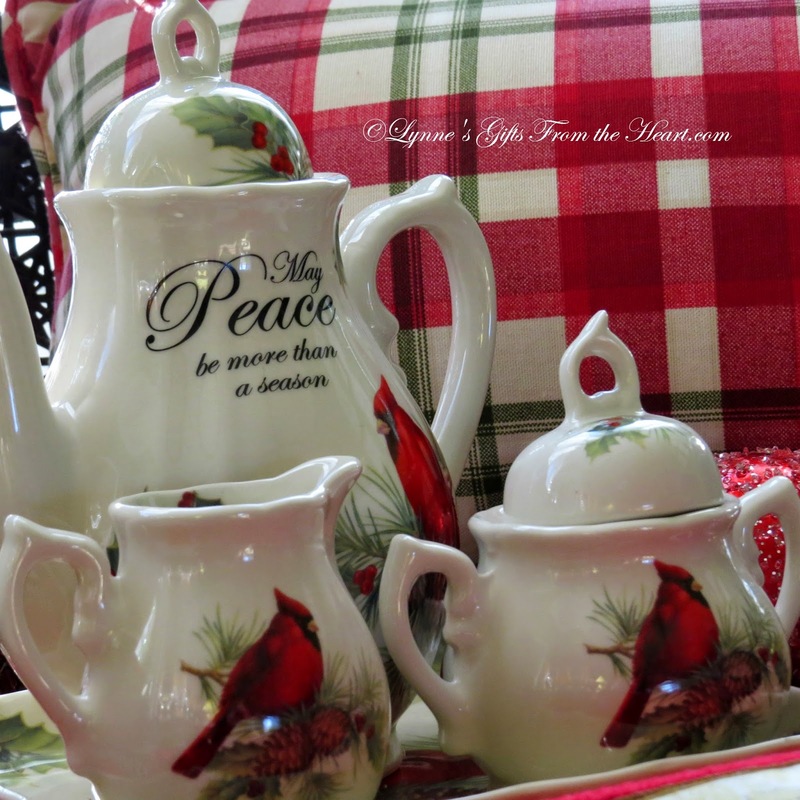 As your tea pot says, "May peace be more than a season" for you. I know it's tough. The last picture looks like nothing short of an invitation to tea! Just lovely!